Discussions with Prescott about a contract extension are in progress according to Cowboys executive vice president Stephen Jones, Kate Hairopoulos of The Dallas Morning News reports. Cowboys vice president Stephen Jones suggested Prescott has earned a contract extension, Jon Machota of The Dallas Morning News reports. "You look at a quarterback that has had the success [Prescott]'s had," Jones said Tuesday. "He's done everything the right way. I think he deserves to have his contract looked at in a very progressive way." Analysis: Prescott is entering the final year of his rookie contract, and while he hasn't quite built on his debut campaign the way the Cowboys were hoping, there's no doubt he's a starting-caliber quarterback. His status as a fourth-round pick eliminates the possibility of a fifth-year option, but the team does have the threat of a franchise tag to provide some leverage for negotiations. Prescott and the Cowboys will try to reach an agreement on a long-term extension this offseason. Prescott completed 20 of 32 pass attempts for 266 yards and a touchdown in Saturday's 30-22 loss to the Rams. He added three rushing yards and another touchdown on two carries. Prescott completed 22 of 33 pass attempts for 226 yards, one touchdown and one interception Saturday against the Seahawks. He also carried six times for 29 yards and a touchdown during the 24-22 win. Prescott completed 27 of 44 pass attempts for 387 yards and four touchdowns during Sunday's 36-35 win over the Giants. 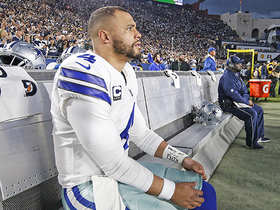 Prescott said he plans to play every snap Sunday against the Giants, but he acknowledged the possibility that doesn't happen, David Moore of The Dallas Morning News reports. Prescott completed 20 of 25 passes for 161 yards with a touchdown and no interceptions in the Cowboys' 27-20 win over the Buccaneers on Sunday. He also gained two yards and scored another touchdown on four rushes. Prescott completed 24 of 39 pass attempts for 206 yards and one interception during Sunday's 23-0 loss to the Colts. 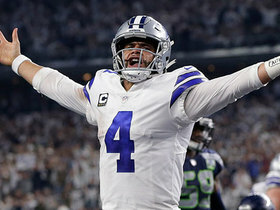 Prescott completed 42 of 54 pass attempts for 455 yards, three touchdowns and two interceptions in Sunday's 29-23 overtime win over the Eagles. Prescott completed 24 of 28 passes for 248 yards with a touchdown and no interceptions in the Cowboys' 13-10 win over the Saints on Thursday. He also rushed five times for 22 yards and fumbled twice, recovering one. Prescott completed 22 of 31 pass attempts for 289 yards and two touchdowns Thursday against the Redskins. He also carried six times for 18 yards and a touchdown during his team's 31-23 win. Prescott completed 22 of 32 pass attempts for 208 yards during Sunday's 22-19 win over the Falcons. He also carried four times for five yards and a touchdown. 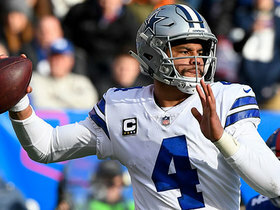 Prescott completed 26 of 36 pass attempts for 270 yards and a touchdown, adding nine yards and another touchdown on six carries in Sunday's 27-20 win over the Eagles. 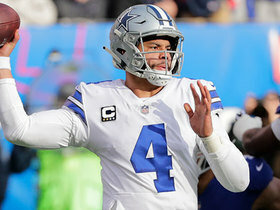 Owner Jerry Jones said Tuesday on his weekly radio show that Prescott remains the Cowboys' starting quarterback both this season and for the foreseeable future, Jon Machota of The Dallas Morning News. "Listen, Dak is the quarterback of the Dallas Cowboys," Jones said. "He's young and he's going to get extended." Prescott completed 21 of 31 passes for 243 yards, two touchdowns and an interception in Monday night's 28-14 loss to the Titans. He also rushed twice for 11 yards and lost a fumble. NFL Network's Jane Slater reports the latest surrounding upcoming Dallas Cowboys quarterback Dak Prescott, wide receiver Amari Cooper, and running back Ezekiel Elliott's contract extensions. 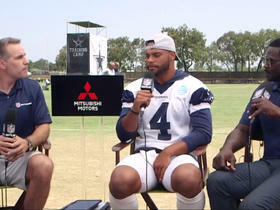 The "Inside Training Camp" crew catches up with Dallas Cowboys quarterback Dak Prescott at training camp. 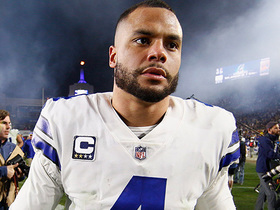 NFL Network's David Carr and Willie McGinest discuss Dallas Cowboys quarterback Dak Prescott's contract situation this offseason. 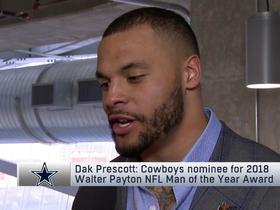 NFL Network's Amber Theoharis catches up with Dallas Cowboys quarterback Dak Prescott ahead of Super Bowl LIII to talk about what it means to him to have been a Walter Payton Man of the Year nominee, Super Bowl LIII and more. The "Good Morning Football" crew discusses which young quarterback needs a win the most in the divisional round. 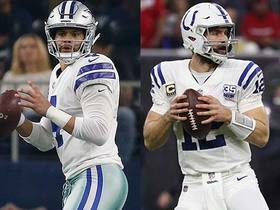 NFL Network's Peter Schrager talks about Dallas Cowboys quarterback Dak Prescott's best plays from the Cowboys Wild Card Weekend win over the Seattle Seahawks. 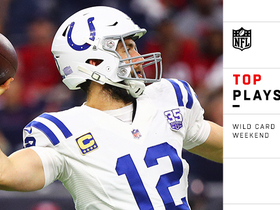 Check out every touchdown scored on Wild Card Weekend of the 2018 NFL season. 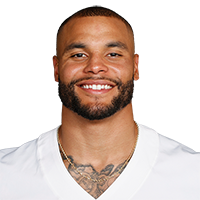 NFL Network analysts talk about what Dallas Cowboys quarterback Dak Prescott must do to beat the Seattle Seahawks in Week 18. 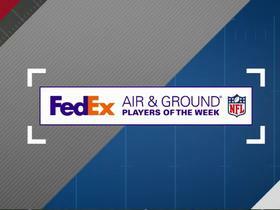 Dallas Cowboys quarterback Dak Prescott and Chicago Bears running back Tarik Cohen have been voted the FedEx Ground NFL Player of the Week for Week 17. Dallas Cowboys QB Dak Prescott mis-fires on a couple deep passes to wide receiver Amari Cooper vs. the New York Giants in Week 17.